Exclusive Interview with Reanimated filmmaker Tom Byrne: What’s it like to crowdfund the end of the world? So, can you tell us a little bit about your film? 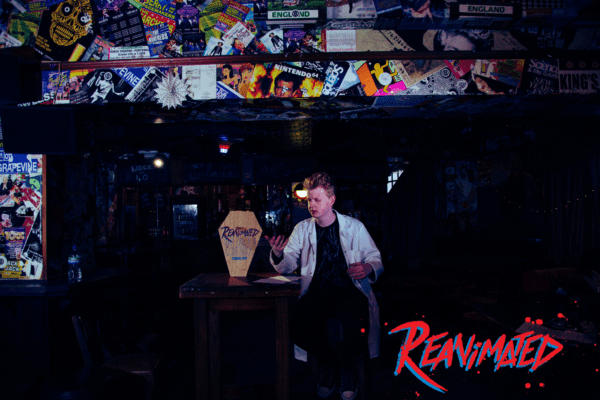 Reanimated is about all of those exciting ideas you have about moving away to university or college crashing down in an instant because your new flatmate is a mad scientist. The friends you’re going to make, the parties you’re going to go to; it all dissipates when you step into your new flat. Because you see Herbert West, and he’s set up his weird flashing lab equipment all over your kitchen, and in one arm he’s holding a syringe and in the other he’s holding a mouldy severed arm. And then the severed arm waves at you. That’s the first image you get of Reanimated, and I think it represents the story well. It’s a reimagining of a Lovecraft tale, bringing the character of Herbert West and setting into the present day. We’ve got a focus different from any other adaptation of the original short story, as the whole film spans the first few days of term at Miskatonic University. It’s early days for Herbert and his experiments, but that doesn’t mean things get any less freaky. Lovecraft was first published over a hundred years ago. For anyone who doesn’t really know a lot about Lovecraft, can you explain why we’re still talking about him today? The ideas! With a lot of Lovecraft’s work you’ve got characters in search of some kind of ancient forbidden knowledge or secret. In true gothic fashion they’re often horribly punished for their inquires – but the journeys are captivating. Gods, underground cities, secret societies – even the concept of humanity being utterly irrelevant in the universe was a pretty radical idea at the time. There are some ideas that won’t ever go away. There’s the shared universe element too. Answers aren’t typically something Lovecraft is particularly interested in sharing, but his short stories take place in the same universe. It’s exciting piecing together Lovecraft’s cosmology with each fragment you pick up in the stories. That kind of world building is engrossing and even though it’s obviously fiction the idea that Lovecraft might have known more than he’s letting on is incredibly tantalising. Like many others, I have conflicting feelings on Lovecraft. He was a disgustingly racist individual and that does come across in his work – it’s pretty much the embodiment of the “fear of the unknown”. As a wrapping gift I’ve promised myself a copy of the book Lovecraft Country which I’ve heard does interesting things in exploring that all in a modern context. And where does the “Reanimator” story fit into Lovecraft’s world? The Reanimator story is quite unlike anything else Lovecraft wrote. I think he saw it as a bit of a cash grab in honesty – it was commissioned as a serial and each chapter required both a recap and a cliff-hanger. In the last few chapters or episodes things get increasingly absurd, you can almost feel Lovecraft trying to keep himself interested. Which makes it the ideal piece to adapt! It’s actually quite freeing. Lovecraft’s work entered the public domain a while back, which puts Herbert West in the same sort of category as Dracula and Sherlock Holmes – meaning anyone can offer their interpretation, be it in film, comic or board game. While it has a lot of fans, this particular story is often seen as the runt of the collection so it’s fun to come in and explore different elements of the tale. This story is actually the first introduction of the Miskatonic University. We’ve put a lot of work and consideration into how this infamous institution exists in 2019, and we’re looking forwards to showing that. What are some of the practicalities of making this particular film? The big one is the effects. Looking at the original Lovecraft story, the body horror is a huge part of it and one of the first challenges we’re working on is how to convey that on film. Practicalities is a good word actually – when we start shooting, I want the grotesque effects to have a presence. I genuinely think that practical effects evoke a different performance from actors. We’ve done a few make-up tests with our lead corpse – the Dead Man who’s played by Gareth Henry – and there’s definitely a different energy in the room when he’s standing after the full physical transformation. Why did you decide to crowdfund the movie? While we were conceiving the project, one of the most important ways we were talking about was in terms of scalability. It’s a tricky production. I’ve mentioned the effects. You have science labs, you have reanimated corpses, you have a sequence where a horde of freshers are murdered in a night club… Do you get what I mean? It’s not an easy decision to ask people to help fund your movie, so we were really keen to make sure the rewards and incentives suitably paid thanks. How’s the crowdfunding process going at the moment? Have any of the realities of it taken you by surprise? Surprisingly, we’re over half way funded! I talked about Herbert West being in the public domain, but I didn’t really mention the dedicated fans, whether they’re from the original Lovecraft story or the Stuart Gordon films. Crowdfunding also works as a way to bring them on board from the start of production – showing off the effects, behind the scenes as we’re working. Compared to a lot of campaigns, we’re not actually asking for that much, as we were able to raise part of the budget before we started pre-production. This has meant we’ve had a much more intimate campaign so far – we’re looking at each and every backer and thankful for each one. It’s almost like a club. We’ve been doing a lot of behind the scenes stuff over the last few weeks so very excited to start sharing more exclusive updates – which we’ll keep going throughout the production. I’m also keen to frame it as a conversation – I’ve made sure we’re replying to all the questions and comments about the production through our social media. I’ve always known that the audience for Reanimated would be out there; it’s a case of doing everything we can to find them, which is why likes and shares to our pages can make a massive difference. It’s all appreciated, more than anyone can know. Speaking on behalf of all of Team Reanimated, we’re also incredibly thankful for the support of our friends and family who have shared and or donated. Once you’ve finished Reanimated, where do you see your production company, Familiar Stranger Films, going next? We’ve definitely been thinking a lot about what we want our body of work to look like over the next few years. I think the key is variety – Reanimated is a horror comedy, but that’s not the only type of film we want to be making. I think we’ll be going in a very different direction for our next project. Which direction that will be we’re not quite sure. There are ideas for a run of conceptual sci-fi shorts we’re playing with, they’d be standalone but linked – that’s obviously a vague description, but the main appeal for me is that they’d be much smaller and more intimate films than Reanimated. We like getting to have our cake and eat it too! What would you most want audiences to take away from Reanimated? I think through all the freaky stuff and the body horror, it’s about weird guys trying to make connections and it’s not hard for all of us to remember a time when we were there. It is a strange story and it refuses to go in any direction you’d expect – and that’s especially for audiences who think they know the story – and I think a lot of people will have their own take on it. I’ve been working on this project for a few years now – and I’m so ready to hear what those takes are. Tom Byrne, thank you very much! The Reanimated Kickstarter can be found here. Image Credits: Familiar Stranger/Mister Ames.